Training in the winter months can have dire effects on your skin, get ready to say hello to very dry and very chapped skin and lips! The mixture of sweat, the cold, harsh winds, rain and central heating all plays a part in our skin suffering as we try and upkeep the training schedules we have all worked so hard in organising. It doesn't make it any easier especially as this is the most important time of the year to train with the races to come in the new year (bring on London marathon!). 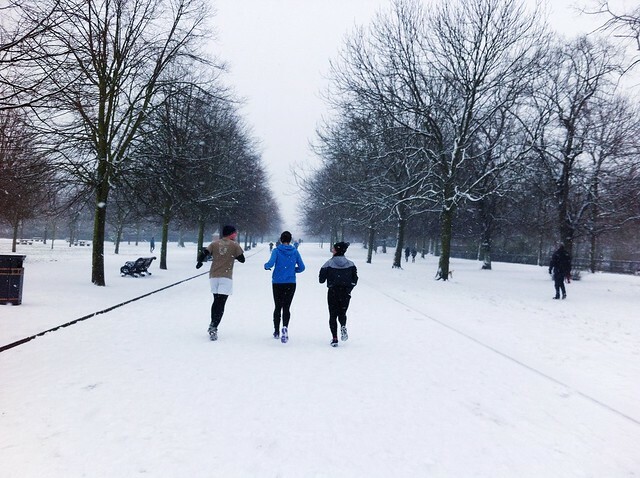 From running and cycling in the cold, we've certainly noticed we need to up our skincare regime. But, where do we start? What should we use? We know food, we know fun and we know fitness….but beauty?! Yeah, totally not our forte. So who better to speak to than a Beauty Editor? Steph Powell has kindly written a guest post for us with her top tips and listing products she swears by to help us save our skin. Say farewell to crusty skin! Winter is pretty much the absolute worst season for skin. There’s less sun to feed you skin-nourishing Vitamin D, the cold leaves your lips chapped and on top of that the wind dries everything out. It’s such a magical time. With all this trouble waiting for you, it’s important to assemble a killer routine to make sure you can still keep up with your exercise regime without letting the weather destroy your endorphin-powered glow. Here’s a routine you can follow to keep your skin in perfect condition. Wash your face thoroughly before you go out for your run or to your anti-gravity yoga class. Clear, unblocked pores free of makeup are happy pores. If you’re going out running in the daytime, you have to wear sunscreen. Yep, even in winter (just because you can’t feel the sun, doesn't mean it’s not there, slowly frying your face). If you’re at an age where you start noticing lines and wrinkles (and apparently that age is 25), sunscreen is pretty much the only tool you have to fight them. It’s best to keep skin bare when working out, but if you’re heading outside, you need to give your skin a barrier between it and the harsh elements – use a lightweight moisturiser with a built in SPF to cut down on layers (like Kiehl’s Ultra Facial Moisturiser SPF30, £17 or Simple Kind To Skin Protecting Light Moisturiser, £4.99). In all honesty wearing a balaclava is probably a good idea too, but if you go running around London wearing a balaclava somebody is probably going to get arrested. 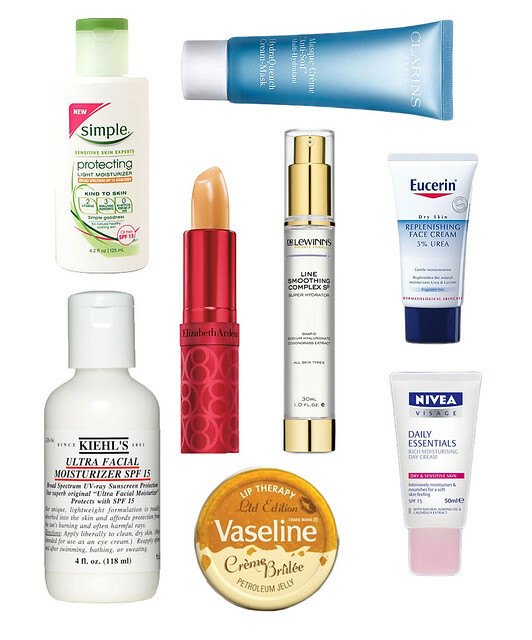 Your lips will appreciate a thicker barrier, so get a nice rich balm: iconic Elizabeth Arden Eight Hour Cream Lip Protectant (£20) is kinda pricy but so good, plus the stick form makes it handy for travelling and on the spot application. Good old Vaseline would work just as well though. Sweating severely dehydrates the skin so when you get back from your run, wash your face again ASAP. Exfoliating a couple of times a week is a good idea too, as it will clear away old skin cells so nothing gets trapped and starts a breakout. After cleansing this time apply a heavier moisturiser that’ll put some water back into your skin, and prevent it from drying out. My absolute favourite winter moisturiser is Eucerin’s Dry Skin Replenishing Face Cream (£12.50) – brace yourself though; the reason it’s so good is that it contains 5% urea...which comes from urine. Urea is in loads of things you probably don’t know about and it’s a miracle worker when it comes to rehydration (eczema suffers are given 40% Urea creams), so try and forget I told you that and just get it. If you choose to ignore me and aren’t so comfortable being that involved with pee, then fine, suit yourself, try Nivea Visage Rich Moisturising Day Cream (£2 - BARGAIN). For an extra moisture boost, a good face mask a 2-3 times a week will make a huge difference – Clarins HydraQuenchCream Mask for dehydrated skin (£33) is awesome, and it’s super easy to use: no green mud all over your sink and towels afterwards, you just wipe it off with a cotton pad and some toner. There are also boosters you can buy to increase the impact of your moisturiser – not many brands make them though and they’re quite expensive. Dr Lewinns Super Hydrator is good. For particular problem areas, when you go to bed pack on some of the aforementioned 8 Hour Cream (you won’t regret investing in a tube, it lasts about two years): too thick and sticky to wear on your face in the day but at night only your boyfriend/housemates/pillowcase has to endure it. It’s not just about products, since the ladies at F&L are all about the eating I thought we better mention the food side too: Omega 3 (found in oily fish like salmon, mackerel and trout) and Vitamin C (kiwi and guava are actually higher in VC than oranges) - both promote supple, soft hydrated skin. I’m sure we’ll all be waiting on the edge of our seats for their mackerel and kiwi smoothie recipe! CrossFit Bold: Are you a CrossFit rookie?